It's time to Build Your Agenda Up, Buttercup! The Foundation for your agenda is below- add the optional sessions during registration for a rockin' set list! Click here for instructions on how to add sessions to your registration. Download an Easy-to-Read Agenda Here! Please note the agenda is subject to change. Check the website for updates! Select "Advanced Search" to search by date, product, subject, speaker and more! Sign up for your breakout sessions within in your registration. Hurry! Classes fill up quickly! This is your ArtioCAD session to start all sessions at EskoWorld 2019! In this session, we will not only walk through a workflow from beginning to end but also walk through which EskoWorld sessions to attend along the way. Come with an open mind for new ideas and change!! In this Session, participants will learn about the benefits and common mistakes made in Automation Engine workflows with art files linked to a structure file. 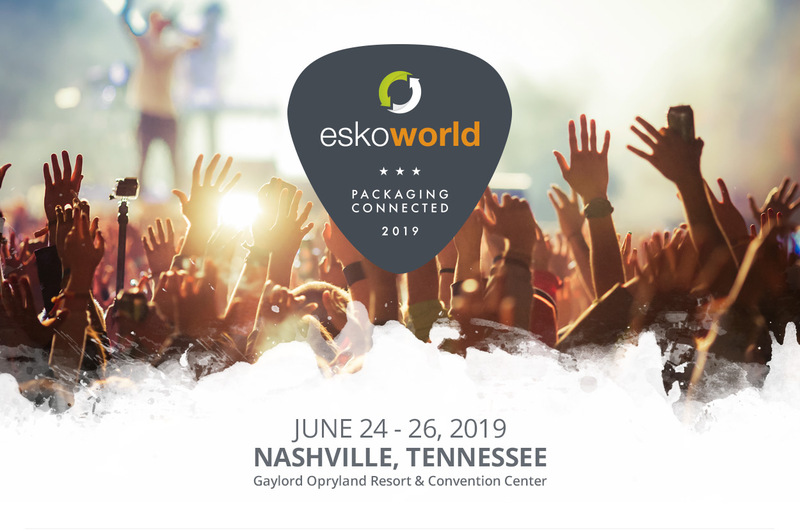 Don’t miss the opening gathering for brand owner attendees at EskoWorld 2019! We will set the stage for the Brand Track agenda and provide an exciting and detailed outlook on the current and future state of the Esko Brands business now that Esko’s integration of the Blue organization is complete. Come see how our customers integrate Esko products with their systems! The Digital Maturity Model isn't only for brands! Join Jan de Roeck as he kicks off the Executive Summit with an exciting and popular subject for all! Your Digital Press is Too Expensive to Use as a Proofer!! An emulation proof is a proof made to match a digital press which is an "emulation" of something else (a flexo press, GRACoL, etc.). In this session, we will deep dive not only how this works for spot color and process colors but also how to set up and check end emulation proofing strategy. Go BackStage at EskoWorld! Get your BackStage pass and explore all that Esko has to offer! In this room you'll be able to set up 1:1 demos with Esko experts, check out our Crystal 4835 CDI in action, take a mini class and more! Open during conference hours (except during General Sessions), BackStage at EskoWorld is THE place to chill out and dive deep on your favorite products! Join us to see the future of these products and provide your direct feedback to Esko! Press are invited to join us for a Press Conference. In this session, participants will learn how to combine multiple 3D shapes into a single composition to load as a scene in Adobe Illustrator. We will cover topics such as: adding product inside a package, multiple versions of packages and building a pallet display in Toolkit. Discover how Adobe Illustrator determines how to load different graphics on shapes of the same size and be able to override in efforts to build compositions the way you intended them to be. Pre-Requisite: Attendees should have a working knowledge of Adobe Illustrator and Studio Toolkit Stand-a-lone application. In this session, we will learn how to maintain a clean environment and perform standard administration maintenance including but not limited to user role management, group management, out of office, role management, etc. Join Arka in their presentation, "The Value of Branded Packaging." Join Kevin Ford, Senior Brand Manager of MillerCoors, in his presentation "Building a Connected Culture." In this session, participants will learn a variety of basic drawing techniques in the context of ArtiosCAD's Canvas format. The ideas presented here are directly applicable to any ArtiosCAD 2D drafting format and will outline several of the most common drawing tools including Running Standards, importing files, and drawing by hand. This session is the perfect fit for newcomers to ArtiosCAD and will provide the foundations for a number of the later sessions! This session will be an interactive workshop where attendees will learn to analyze and assess their organizations level of digital maturity when it comes to their packaging/artwork development process. The outcome will be a tangible outline of current status and a view of the desired future state for attendees to take back to their leaders and teammates. In this Session, participants will learn about the different workflow controls to help you manage your files within Automation Engine. Join Kristen Estep of Turner Labels in her presentation, "When the Label is your Brand." Come and see our corrugated tools in action! Learn firsthand how to get the best out of the Corru-speed tool. In this session, we will explore ways to optimize production to get a better through put. Additionally we will showcase our products such as automation devices for digital finishing, print to cut registration, traditional registration, edge recognition and underside camera. Roadmap is integrated in this session. With a proofing system, what might at first appear as random color variation is actually a methodical and diagnosable problem. In this session we will learn to how use logics to diagnose and resolve proof color match issues. Join Esko expert, Ron Wolf, as he reveals the best tips and tricks related to SmartMarks! Join Allan Lawlor of Idealliance in his presentation, "BrandQ Certification for the Supply Chain." In this Session, participants will learn how to use the ArtiosCAD Enterprise Browser. Creating projects, saving, and searching for files can be daunting at first but we will guide you through these processes and discuss the many benefits of published data. Not using Canvas in your design workflow? See the fundamentals of the in-one file option for ArtiosCAD. We will cover all the Canvas Tools/Parts options, understand the relationship to 3D, utilize BOM's and so much more. Pre-Requisite: Basic Understanding of ArtiosCAD concepts. In this session, learn how to convert from using ArtPro to ArtPro+ within your Automation Engine Workflow. Join Prakash Dharmani of Essel Group India in their presentation, "How WebCenter Facilitates Multi-Site Production." In this session, participants will learn the basics of creating a preflight profile for packaging. Learn how to find and solve problems right at the source. This session will review the various methods of preflighting within Adobe® Illustrator®, ArtPro+, and Automation Engine. Come and understand how you can automate production for Kongsberg using the board feeder & stacker, the robot with 1 or 2 tables, features of the dynamic gripper, topside camera and the new underside camera. How to use it, what it looks like, how much space does it take, and the ROI for increased through put and profitability. Roadmap is integrated in this session. Software deployments are an ever-evolving journey within an organization. In this session, you’ll learn some tips of the trade from an Esko Solution Architect who has been knee-deep in many of Esko’s largest deployment projects. After this session, you'll be able to give your best effort around gathering your requirements up front to ensure continuous improvement as your software is deployed. Join Mike Onderwater, Senior Manager Design to Print of KraftHeinz in a customer presentation. More information to follow. Join Joe Lydic of ProAmpac in his presentation, "HDFlexo, Finding the Sweet Spot." Participants will learn to create multi-up layouts from a variety of starting points, including Canvas and single designs. Back by popular demand! In this session, we’ll end day one of the Brand Track by enabling peer-to-peer discussions on a variety of pertinent topics. Frank Adegeest, Esko's Director Product Management Digital Finishing, enthralls you with his presentation, "How Value Stream Mapping Reveals Waste Reduction Opportunities." In this Session, participants will learn how to prepare a file for finishing, open and edit your file in iPC, and cut. Come and see the table in action!! In this session, we will review best practices and tips and trick for Imaging Engine. In this session we will dive deep into case studies related to Print Control Wizard and Crystal Screening. High ruling AM, Stochastic, and Concentric technologies are making a comeback in offset for packaging and significantly improve expanded gamut. This presentation will provide a deep dive into these technologies and describe why they are making a comeback. Jan de Roeck will wrap up the Executive Summit with a review of today's content, a lively discussion among attendees and final comments. Continue the conversation from today's robust sessions at dinner! Esko's executive staff will join to hear your takeaways from EskoWorld's Executive Summit! Join Esko's Running Team Captain, Samantha Thompson, for a fun run on Tuesday morning. Meet at the Cascades Lobby for a map and to join the group! Participants will receive a t-shirt upon completion! Join the experts for breakfast! Breakfast tables will be stationed with signs based on topic and seated with Esko staff ready to answer your questions and dive deep on your favorite subjects! In this session, participants will learn the basics of taking 2D designs and working with them in the 3D workspace to create soft-proof fit and design elements. Creating soft-proofs in the 3D workspace are powerful marketing tools that help to save material when testing prototypes. This course will discuss the best tools for checking designs for accuracy and how to make impactful virtual models. In this session, we will discuss the differences between flat and rotary dies, stripping rule v. scrap knife, and adjusting rotary bolt holes. Color Preflight checks the gamut of colors in the job before sending it the digital press. HP Indigo users can select the best color strategy and optimize press utilization. In this session we will show how easy it is to use the preconfigured workflow to create a standard preflight report. In this hands-on session, we will explore Equinox Image for Photoshop. Come and ask any and all questions regarding digital finishing! The Esko team is ready to any questions you may have and listen to your needs. Roadmap is integrated in this session. Join us as we explore WebCenter QuickStart for Folding Carton, a turnkey packaging design workflow management solution for folding carton converters. Get the inside scoop on our future plans for WebCenter, direct from Esko’s Product Management team. Also, become an active participant in our voice-of-the-customer process. Your feedback is essential when it comes to further developments in our WebCenter application that will meet the needs of our fast-growing customer base in the months and years to come. Take your WebCenter usage to the next level with these top 10 tips and tricks for intermediate WebCenter users. In this session, participants will learn the basics of taking imported files through a re-design process. Often imported files may have gaps or issues when being brought into the ArtiosCAD workspace. We will identify these issues using CAD Preflight and use a selection of the Adjust and Edit tools to resize, fix and adjust “broken” or “foreign” designs. In this session, participants will learn to harness the mate tools in ArtiosCAD to aid in assembly or rebuilding assemblies in 3D. In this session, you'll learn how to run a preflight check, file cleanup, proof slug, trapping, and step, repeat, distort, marks. Hear it straight from the man who started it all! Stephen Kaufman, who founded Blue software from the ground up, provides his vision for existing customers on product development now that the integration with Esko is complete. Learn about flexible material production, new tools, the Roto Cut tool and QR code reading. Run jobs longer than the table, finishing fabrics, and adding flexibles to a traditional sheet fed business. Experts will show you how to produce your applications in the most efficient way. Roadmap is integrated in this session. A panel of flexo experts from Esko and our partners discuss the current trends in flexo. Join us to explore what's new in AE QuickStart for Sign V2. We will review the new AE 18.1 Gang Run tools, Public Parameter workflows, documentation and Introduction to Standard XML Integration. In this session, participants will learn the basics of creating customized resizable designs in ArtiosCAD. We will use the Canvas format to create a variety of parametric parts and utilize a variety of common variables to create parts that interact within the file. Building on the concepts learned in previous courses; this beginner session will get you started on creating and customizing your own Standards library. In this session, Folding Carton manufacturers will learn how to use the power of ArtiosCAD and ArtPro+ combined in a Folding Carton workflow. Looking to finally gain control of your content management and approval processes? Then don't miss this session led by two of Esko's foremost experts in this space. Benjamin and Karsten will highlight the latest solutions that can bring major efficiencies to how you manage your copy statements and other packaging related content. In this Session, participants will learn how to get a smooth workflow for digital finishing. Participants will learn how to prepare files correctly and export files to the Kongsberg table, from a variety of prepress software. Explore digital print prepress requirements for digital production. Roadmap is integrated in this session. In this presentation, we will review WebCenter QuickStart and Integration. Join Anne Samoyedny, Senior Manager Marketing Logistics, of PepsiCo on her presentation "Packaging Management Best Practices." In this session, participants will create a variety ArtiosCAD 3D solid primary packaging (Bottles, Caps, Thermoforms) using simple 2D parametric Stylemaker techniques for use in sizing or designing secondary packaging. Pre-Requisite: Attendees must be comfortable with drawing in ArtiosCAD. In this session, we will take a deep dive into creating geometry macros. This will include building a macro designed for the new Panel from Line feature as well as some techniques to make macros do the work for you. Attendees will learn to create marksets with ArtPro+ and DeskPack. During this session we will cover the advantages of integrating ArtiosCad (CAD) & Automation Engine (Graphics) with MIS system with focus on a Folding Carton workflow. We partner with industry leading MIS vendors, but you will learn how to integrate your MIS via XML for both CAD & Graphics. Join Frank Goddiess, Director of Packaging Systems, of Colgate-Palmolive in his presentation "Analyzing User Feedback." Learn more about production for rigid materials using routing, and other dedicated tools. We will discuss Braille signage, milling acrylic, and milling and v-notch of di-bond. Learn how to find the best settings and select the right bits and blades. Ask a expert how to improve your applications or get inspired for new ones. Roadmap is integrated in this session. Learn how incorporating document references can transform the way you utilize WebCenter. Join George Olarte, Visual Brand Design Manager, of Spin Master in his presentation, "Diary of a Wimpy Packaging Desginer"
In this session, participants will learn about the power of Cape to calculate "right sized" packaging for primary, secondary, or shipping cases. In this session, we will explore “closed loop color” integrating solutions from Esko and other Danaher PID companies. This session is applicable to supplier and brand owners alike. Join Esko experts as we live demo the best tricks within Studio! Angela Clinefelter from Kimberly Clark will team up with Joe Caruso from X-Rite to explain how KC’s print quality program has been strengthened with the use of ColorCert amongst their various print providers in their presentation "Print Quality Gains through ColorCert." Learn how to cut coating blankets on your Kongsberg. We will explore file preparation, choosing the right knife tool, and using the laser/camera for registration. In this session, participants will learn tips and tricks for creating and adding product inside a package as well as shaping a flexible bag around that product. Take your WebCenter usage to the next level with these top 10 tips and tricks for advanced WebCenter users! Let's take a look at the future of Automation Engine today! Join us on a tour of the browser-based Automation Engine QuickStart for Label, available with Automation Engine 18.1. In this hands-on session you will take customer art from initial input, customer approval, all the way to creating a stepped layout ready for your digital or flexo press with just a web browser. Automation Engine QuickStart for Labels 18.1 also contains some other great new features like multigrid support, compare viewer, print finishes support, and the Share & Approve link. In this session you will learn how to better troubleshoot issues with your workflows within Automation Engine. Additionally, we will explore the best tips and tricks to help you gain efficiency in further development of your AE processes! In this session, see the new functionality in the cloud for adding load stability, and selecting the correct board grade to support and protect your load. Build customized databases of boards and materials and upload your boards from your existing desktop files. Store Visualizer is a strong solution to help users understand product placement and help see the "moment of first truth". In this session we will look at the use of this solution from the vantage point of the consumer to help guide us to better utilization of this tool. Guest presenter, Bill Pope, chairman of the Idealliance print properties committee and well-known in the industry, will speak on EGC and color stability. Learn about the amazing features of iPC and how it can help your achieve high quality cuts and high through put. Roadmap is integrated in this session. Join MediaBeacon's Matt Haws, Global Marketing Director, as he teams up with Gil Comeaux, Associate Digital Asset Manager, of Tyson Foods to explore best practices within WebCenter & DAM. Participants will learn how to configure WebCenter to communicate with Automation Engine and benefits of utilizing them together, deleting a file, pushing a file, web services, link a document a doc reference. In this session, participants will learn about the uses of Style Choice menu types in ArtiosCAD StyleMaker. We will discuss the purpose of the menu type, and set up a Style Choice menu and the subsequent formulas necessary to create option buttons within a Standard. Do you fully utilize digital finishing to provide your customer that eye catching prototype? We will take an option from the total package using Studio to apply graphics and iPC to complete the prototyping process. In this session we will show you how to bring your workflow to the next level with Workflow Parameters! Join Doug Ryan, Global Supply Chain Program Manager, of CooperVision in a customer presentation. A detailed look at this ground breaking technology, including what's new with Color Pilot 18, new curve and profile charts, SCTV of spot color tints, and links to QC Systems. Learn about the new Share & Approve solution utilizing the new Esko Cloud. Accessible through a browser, now you can more efficiently use Esko solutions to increase speed to market. Michigan State University PhD Student, Alyssa Harben, discusses recent project to bring old fashion packaging to life, both physically and virtually, to assist MSU Museum with educational tours. In 2 separate independent study courses, students led by Ms. Harben undergo the recreation of packaging components from the late 19th century to allow students touring the museum to actually touch and experience then versus now. Working together with a local printer and school resources, replicas of packaging were created for this purpose. As a side study, the results are also to be used with virtual reality segments of study for the Museum. In this session, we will explore the new trapping engine, Powertrapper tips, sifting through the interface and more! For anyone in need of a validated solution – either now or in the future – don’t miss this session where Jay Mistry, a veteran of many validated deployments, will be offering his advice on how to tackle this important topic. Join Nashville's Habitat Yoga Instructors for an hour long yoga session before we wrap up the final day! Mats and props will be provided. Participants will receive a t-shirt upon completion! Our final breakfast in Nashville will be one more networking opportunity! Tables will be marked by topic and we encourage you to sit with your peers and discuss your favorite Esko subjects! Isn’t Canvas only used for multiple component designs? Think again and come see all the other benefits for the all in one file for ArtiosCAD. We will cover Layouts, Report Templates around Parts/Layouts, options for multiple design options and some advanced XML outputs to integrate with our other products. In this session, we will customize and modify ArtiosCAD default "Standards" in Stylemaker to make them YOUR custom standards. Taking ownership of our Standards library of designs will increase your productivity and reduce errors. Ever wonder what the future looks like? Susie Stitzel and Karsten Daemen will be unveiling the latest developments in our quest for automating the artwork creation process using a variety of Esko solutions. We will also welcome feedback for how to best plan for continued development in this area. In this session, we will explore how to create MFG Layouts on demand, the latest and greatest node for generating press sheets! In this session we will use real world artwork preparation to explore how you can utilize Deskpack plugins (Data Exchange, Trapping, Barcodes) to create output in Automation Engine. Rory Marsoun will present and overview of Esko groundbreaking screening technologies for flexo. Mark Samworth will then present a deep dive on Crystal screens with cells throughout the full screen range and the benefits for wide web film. In this Session, participants will learn best practices for setting up i-cut Preflight and i-cut Layout, interacting with Automation Engine and production tips & tricks. Pre-Requisite: Working knowledge of i-cut Preflight 16.0 and i-cut Layout 16. In this session, we will provide you with the tools to make the switch from Nexus to Imaging Engine. In this Session, participants will learn how to use Reporting tools to create outputs and data blocks that go beyond a single Spec Sheet. Here, we will learn how to use the ReportMaker tools to create geometry macros and full size outputs such as mylars and spot sheets. Ask the experts any and all questions related to Automation Engine and DeskPack! Be sure to use the app to submit questions ahead of time! End your Brand Track Experience with a final, lively discussion amongst your peers as you prepare to leave EskoWorld with exciting new ideas and plans for returning home. In this session, participants will learn about the connectivity between Cape Pack and ArtiosCAD. Learn to fluidly transfer data between ArtiosCAD and Cape Pack, calculate solutions, and output data through a variety of reporting methods. Pre-Requisite: Basic understanding of Running a Standard in ArtiosCAD and entering data in Cape Pack. In this session we will explore how ColorCert for Flexo and Packaging can be used in conjunction with Esko products. In this session, we will explore the QuickStart Solutions in all forms. Take an in depth look at the tools available in the movie sequence builder in Store Visualizer and tips for achieving great animation to create exciting videos to show off your store environment. Join this session to explore the updates in WebCenter 18.1 including conditional formatting, duration reporting and more! That's a wrap! Join us for a closing session to review the week's most exciting moments and to find out where EskoWorld 2020 will be held! The conference ends at Noon.